One hundred five patients (not on sirolimus treatment, out of 316 patients examined) had at least one fasting serum ACE activity level greater than 52 U/l (the upper limit established by the NIH Clinical Research Center, black line). Each column of dots represents the ACE activity levels of a patient, measured at visits to the Clinical Center. 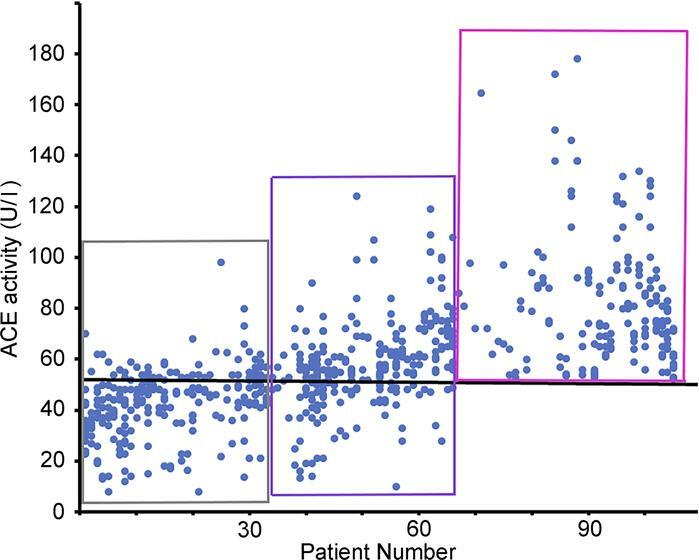 Gray box: patients 1–33 had ACE activity levels greater than 52 U/l less than 50% of the time. Purple box: patients 34–66 had ACE activity levels greater than 52 U/l at least 50% of the time. Red box: patients 67–105 had ACE activity levels greater than 52 U/l at all visits.